Dog diabetes develops in approximately 1 out of every 500 dogs. 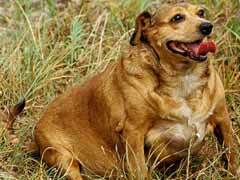 Female dogs and certain breeds are more prone to developing dog diabetes than others. Diabetes symptoms in dogs include drinking more water than usual, urinating more often and in greater quantity, and acting sad or lethargic. If you notice that your pet has these symptoms, be sure to mention them to the veterinarian at Fido’s next visit. Diabetes in cats or dogs can range from mild to severe. At any level untreated diabetes can lead to other health complications and even death. There are two types of diabetes. In the first type, the pancreas does not make enough insulin. Insulin takes glucose (sugar) out of the blood and delivers it to the cells where it is used for energy. In the second type of diabetes, there is enough insulin but the cells are resistant to letting it in. You dog may need to take insulin in tablet form. In more severe cases, your dog may need insulin injections that are administered in relation to the feeding schedule. Just like human diabetes, dog diabetes can be treated with medications and lifestyle changes. Regular exercise is an important factor in keep blood sugar stable. There are common guidelines whether it is a human, canine or feline diabetes diet. You can purchase special dog food for diabetic dogs. Always read the label, whether it is dry kibble, canned food or treats. You will want to restrict the amount of fat your dog consumes. A high fat diet affects the pancreas. It can also make your dog gain weight, making the diabetes worse. The dog food should be high in fiber. Fiber helps keep blood sugar stable and helps your dog feel full longer. Another important factor in managing dog diabetes is to feed your dog at regular times.